A variable in program is specific piece of memory. Every variable in a program has a name. We use variable to store a data value in memory and retrieve the data that is stored in it. a) A variable name only contains characters, digits and underscore. Variable names like oh! , Mike-Jack not allowed. b) The first letter of variable name must be letter or underscore. Variable name must not be started with a digit like 8_oclock, 6_pack. 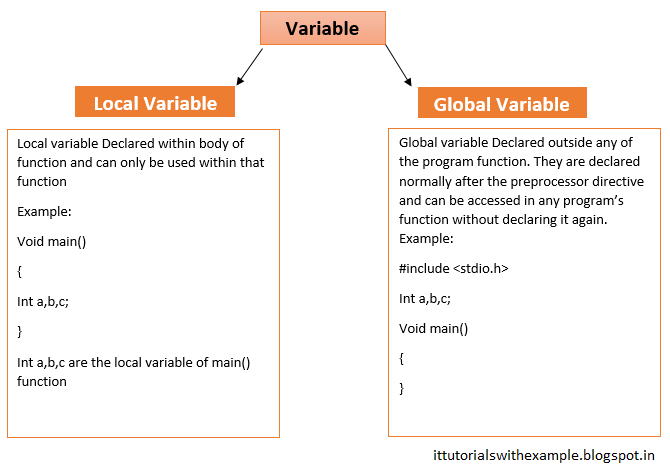 Never try to start variable name with underscore because variable name started with underscore already declared in libraries which can cause quite confusion to understand. c) No comma or blank space is provided within variable name. d) Variable names are case-sensitive. If you declare length and Length are distinct. e) Always try to give Variable name as short as possible and maximum of 31 characters. Giving large name will increase your typing effort. f) You cannot provide C’s Keyword like main, switch as Variable name. Data type can be defined as type of data of variable. Whenever we declare a variable, we have to mention what kind of data it can hold or store. C offers Standard and minimal set of data type. Sometimes called as “Primitive Data Type”. Size Qualifier: Size Qualifier alter the size of data type. There are 2 types of size qualifiers: short and long. Storage space or size of int data type is 4 byte for 32 bit processor. We can increase the range using long int whose size is 8 byte or decrease the size using short int whose size is 2 byte. Sign Qualifier: Signed and unsigned keyword used to specify whether variable can store +ve number or +ve as well as –ve number. A Constant is used just like a variable, though its value never changes. For example: Value of π (pie) in trigonometry is fixed (constant) which is equal to 3.14159265. When we use const keyword, we can specify a Data type for our constant where as in previous example (using # define), PI was just a sequence of characters that replace all the value of PI in your program.